This page is for Subscribers. We’ll share all of our Posts and our Live Public Portfolios with you! Sign Up for a subscription and you can view everything on the Juggling With Knives website. (If you’ve purchased the book, you’ve earned a free subscription. Use the Coupon Code in the book to start your one-year FREE subscription). Plus, you’ll get Jim’s Volatility Email Update each evening at 8:00pm. My fourth pick for my new Perfect 5 ETF portfolio: What to do about fixed income? Every post from Juggling With Knives straight to your mailbox. 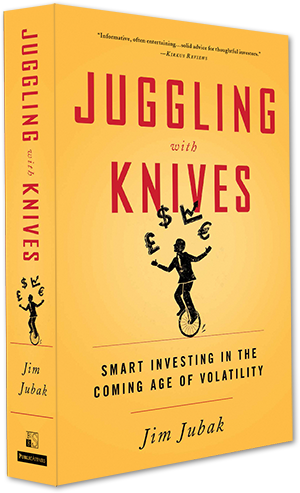 This website is based on my book, Juggling with Knives. Both the book and website are about volatility in everything from stocks and bonds to real estate, and real life topics such as jobs and education. This website keeps the content of the book fresh and the advice and strategies up to date. If you've purchased the book, you've earned a one year free subscription. Use the Coupon Code in the book to start your FREE subscription when you Subscribe on this website. A great way to learn more about investing from Jim. By the way, it's free! First Access to All of Jim's Thinking. Exclusive Access to Lots of It. And did we mention the daily video? That's what you get with the JAM Letter, available only to subscribers.